It’s quite a while ago since I’ve lasted paid the Restaurant Bimi a visit and I can’t entirely remember why I was not such a fan of it last time but I remembered after about 10 minutes. Speed of service is really not their strongest point. 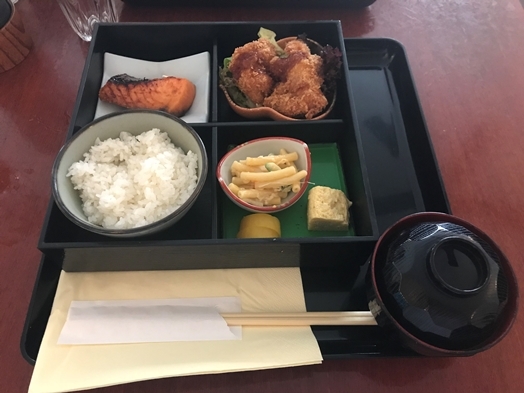 The “bento box (Miso grilled salmon (shake no misoyaki), breaded chicken (chicken katsu), pasta salad (maccaroni salada), Japanese omelet (tamagoyaki) served with rice, miso soup and pickles” (CHF 22.00) is always good in terms of taste but also in terms of price because you get really a full meal for CHF 22.00. What is definitely not up to the task though is the service. They are quite slow and it definitely takes too long until they finally serve your water and/or the main course. The place is generally decent but frankly, it is not the lunch experience you want it to be as it definitely takes too much time for a quick business lunch.